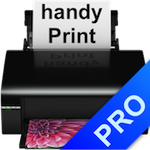 handyPrintPRO is the next iteration of handyPrint. Many of you have asked if it was possible to run handyPrint without logging in on your Mac. This is especially useful if you run handyPrint on a server. handyPrintPRO requires a minimum donation to $20 and we are giving free licenses to anyone who already donated $20 or more. We are also crediting your past donation towards this. If you are interested to try it please click download button above. v5.0.9: Support for OSX 10.10 (Yosemite). Added support for cloning local printers so one can now create “Landscape” or “Photo Paper” printers to output to desired paper and orientation. v5.0.3: Fix issues where blank pages would be printed when duplex was selected. Also fix issues where blank pages would be printed the 1st time the application was used. v5.0.2: Address a minor bug found in the previous release. Some users had reported issues with printing when handyPrintPRO started. The new release will resolve this issue.